March 22, 2012 in category Games, Toys & Apps tags nintendo and 0 comments. The way Western designers and illustrators sucked all the life and energy out of the original Japanese artwork always amazed me. 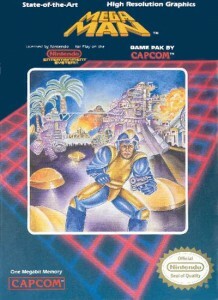 Poor Mega Man got it bad. I bought a guidebook for Mega Man 2 on the NES and the cover was similarly stale but on the back inside cover was a tiny manga version of Mega Man and his foes and I would study it. It was one of first times I saw manga. Around the same time you could pick up import Gameboy games in Peats of Parnell Street in Dublin at half price. They marked the price down because all the packaging and instructions were in Japanese but that was the main reason I would buy them! Penguin Boy and PitMan were two Japanese Gameboy games I got there and the tiny, one colour instructions booklet were just as much fun as the actual game.